This week Lyndal (@Lyndalrogers) picked up her BEAUTIFUL, lush blooms - lovely whites with glistening silver leaves! This week we love new season cymbidium orchids, fluffy dahlias, sweet snapdragons, antique hydrangea and metallic leaves.. how good is Autumn guys?! This week we love - Merryn’s (@merrynamy) beautiful arrangement looking so effortlessly GORGEOUS with the ever so cute - Toby the cat (how lucky we are to have ambassadors with dogs & cats that love blooms as much as we do!). 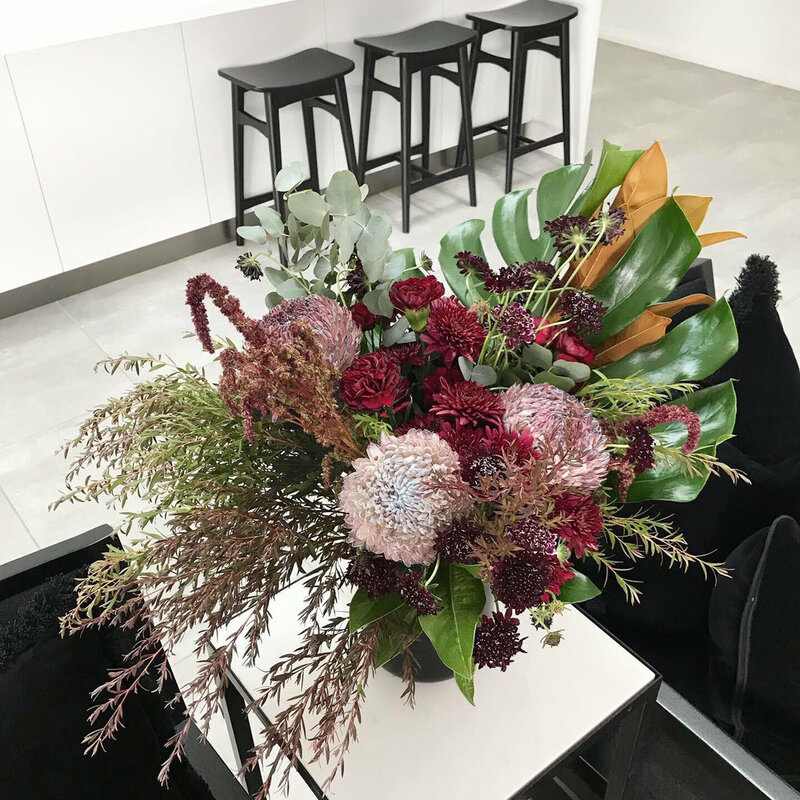 This week we had the most amazing Katerina (@lustlist_) show off these beautiful rich moody blooms that we ADORE. 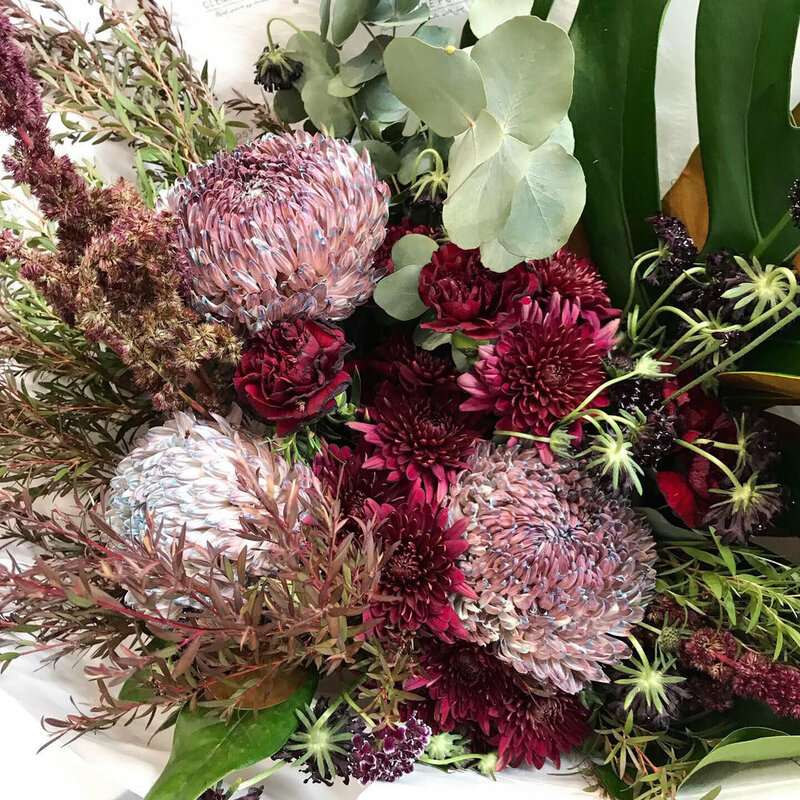 This week we can’t get enough of that beautiful, autumnal textural foliage with scabiosa, disbuds, carnations in deep moody and romantic tones. Autumn is here and although Summer was the best one yet, we aren’t too sad about it. Stacey (@est.building) delivered some BEAUTIFUL, wild and lush blooms in her home - even her doggos are in awe! This week we love Autumnal texture: deep foliages, carrot flowers, black scabiosa, fluffy lisianthus, the last of the fragrant roses and sleek orchids, all in dramatic shades of black and white, gathered into an oversized, all round bouquet. This week we had Keely (@_keely) once again show off these beautiful blooms in her home! You can’t go wrong with these fresh, summery colours! This week we love hints of colours! Big, beautiful and crunchy hydrangea with pastel pink monsteria leaves, magnolia leaves and maroon amaranthus. 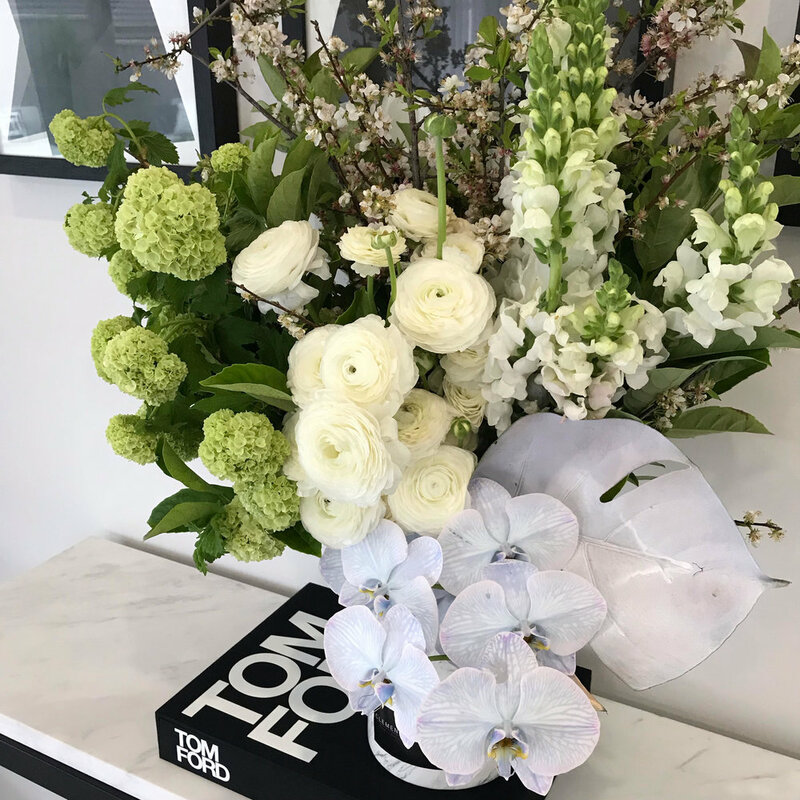 The ever so lovely Katerina (@lustlist_) took upon these beautiful crisp white blooms to showcase in her stunning home. This week we love snowy crisp whites, phalaenopsis orchids, reflexed roses and beautiful, pastel cracked monsteria leaves. This week one of our lovely ambassadors Stacey (@est.building) took home this amazing, tropical and bright bouquet for her home. Created and inspired by Clementine girl Eden! This bouquet of goodness is the perfect summer vibe with bright roses, delphinium and a hint of tropical to welcome you to paradise! This week we had Natalie (@natluzzi) show off her beautiful flowers in her stunning home! Crunchy Hydrangea with pops of fresh summery Dahlias in beautiful coral shades makes us take in and appreciate every lasting moment these Summer holidays. The season of Hydrangea has arrived! Fresh, glistening blooms to go with your summer lovin’ mood. Perfect for a get together at your home and such an inviting arrangement to decor your house. THE DOGS! HOW CUTE ARE THE DOGS?! And yes, the flowers are pretty great too. Stacey (@est.building) shows us how to style her beautiful November blooms in her home. Our fave pink peonies, scabiosa, sweet william and local hydrangea, clustered together with fresh foliage to make a bright and girly bouquet. Treat yourself or someone else with our fave pink November blooms! FLOWER OF THE WEEK: WE LOVE PEONIES FOREVER! This week we had Natalie (@natluzzi) present these BEAUTIFUL local peonies in her home. Nat shows us how versatile these blooms are and how magical they can look by your bedside table, your coffee table or dining table. We love the simplicity of these blooms because lets face it, all you really need is a pretty bunch of Peonies for the month of November! November is our favourite time of the year for one very good reason... PEONIES! We are very lucky to have our hands on some super gorgeous, local, fluffy, girly, everything you could ever want from a flower pretties and are making them our FLOWER OF THE WEEK!!! Send your love, your mum, your neighbour, your bestie or yourself a big bundle of these delightful blooms, gathered up with fresh foliage and presented in our signature CP wrap. We had Keely (@_keely) back for a second round this week! Spring faves in a cute mason jar, a perfect sweet gift to send or to treat yourself! Super fragrant David Austen roses, Sweet William, garden roses, and rhododendron will brighten anyone’s day! We had Katerina (@lustlist_) ambassador once again for this weeks Flower of the week. She gave the flowers a perfect, luxe home and styled them with a modern, classic twist! Spring has sprung buts not exactly been the warmest weather so we channeling our inner Elsa with this pretty creation. All of Octobers best: blossom, snapdragons, snowball, ranunculus in shades of white, topped with an icy blue orchid and matte white leaf, heaped into a gorgeous marble vase. This week we had the fun and bubbly Stacey (@est.building) style her flowers within this cool, industrial theme. She sure likes a pun - “I’m almost peonie my pants with excitement!” was how excited she was to be a CP style ambassador! Spring isn't all sunshine and rainbows.. step into the dark side with burgundy ranunculus, deep purple anemones, fresh local snapdragons, vintage roses, dusty phalenopsis orchids and hints of gold. We love a bit of drama! For flower of the week we had the amazing Natalie (@natluzzi) show us her incredible & colourful blooms in her soft pastel themed home. Our fave orchids are back in the most gorgeous pastel rainbow shades! Four stems, clustered together with fresh foliage and gold leaves to make a super fun and long lasting bouquet. This week we had Keely (@_keely) show off her bright & colourful blooms in her stunning home. As you may of already noticed, us gals LOVE spray painting leaves! It adds such a fun element to a bouquet and it also shows how versatile leaves can be if you get really creative!